Hey guys! Welcome to RoboEye, a small and simple mod inspired by Docm77?s partial cyborg skin. 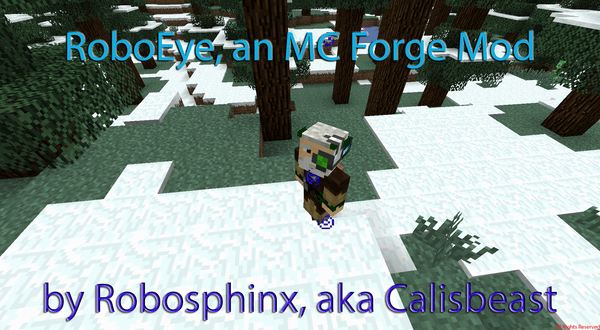 RoboEye Mod adds a few items, which when crafted together, allow the user to have constant night vision. There are two versions of the RoboEye, a standard RoboEye and a Diamond RoboEye. The standard RoboEye offers the same protection of an Iron Helmet, with slightly less durability, and the diamond RoboEye offers the same protection of a diamond helmet with slightly less durability. The other two helmets added by RoboEye are iron and Diamond helmets with the eye integrated right into them, which allows for toggleable night vision, and no annoying particles. These both offer the same protection and durability as their non-RoboEye counterparts. 0.3b0 ? Integrated ModStats.org functionality. Get notified of updates in-game now! 0.2b1 ? Added some peace of mind. 0.2b0 ? Added helmets, fixed flickering with night vision effect, fixed localization errors.